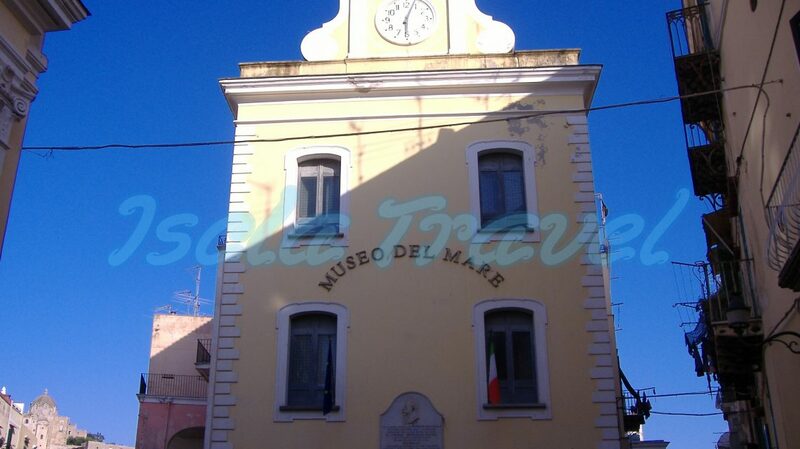 The Sea Museum of Ischia Ponte is a great journey into the history of the Ischia fishing industry. Of course, lschia is an island of land, a place where agriculture has given to its inhabitants much more than fishing, but this does not allow us to ignore the historical burden of an “intense” minority of local fishermen. In order to realize it, you should visit this small museum area in the eighteenth century Palazzo dell’Orologio of Ischia Ponte. Seven halls in a three floor building where ancient navigation and fishing tools have been cataloged, such as telegraphs, compasses, binoculars, baits, hooks and nautical equipment: rudders, propellers, anchors, portholes, oil lamps. There are also stamps, vintage photos, nautical maps. In short, all the finds that, in the absence of important written records, rebuild the collective memory of a community. It is true for the fishermen of Ischia Ponte, Sant’Angelo, Forio, Lacco Ameno, Casamicicola, Testaccio, all men who faced, and still face, the asperity of the sea and the precarious condition that comes from coexistence with a tough element like water transformed into a positive energy, in a desire to live. In addition, to see the pictures of the specific lifestyle of a fisherman , it is enough to go early in the morning on the pier of the Piazzale delle Alghe di Ischia Ponte, just a hundred meters from the Sea Museum. Every day (good weather conditions) ships and small fishing boats arrival at the port is greeted by trembling buyers waiting for the seasonal fish. The show is always the same but at the same time it’s different, telling the stories of the fishermen of Ischia, their faces sculpted by wind and salt and their hands cut by the nets. Do you want to visit "The Sea Museum of Ischia Ponte"?